Runners—especially long distance runners—don’t like to stop. They love to push themselves, both mentally and physically. A new personal best time or distance is cause for celebration. When they are done, they bask in the rush of endorphins – the proverbial “runner’s high.” Does this describe you? Then you know how tempting it is to try running through heel pain caused by plantar fasciitis. We have a word of advice for you: don’t. Even in the first stages of this common soft tissue injury—when you are only feeling a slight twinge of pain under your heel in the morning when getting out of bed—it’s best not to keep training at the same level you have been. Sure, the pain seems to go away after you’ve walked around a little, but it will come back if you don’t seek treatment. This might be hard to hear, but the best thing is really to cut back on the running until your plantar fascia has had enough time to heal. Even then, you need to use a regimen of stretching and gradually return to your normal running program to ensure the same thing doesn’t happen to you all over again. Other injuries and conditions can certainly cause heel pain, but plantar fasciitis is, by far, the leading cause. The most notable symptoms of this injury are pain on the bottom of your heel (instead of in the back) and strongest pain following periods of rest, like after a night’s sleep. The soft tissue can become weakened and more susceptible to damage from repetitive motion in the same shoes. In this instance, you may benefit from switching out your running shoes and trying alternative activities, especially ones that use different muscles and tendons. Doing so will help strengthen these tissues and reduce the cumulative amount of stress placed on them. Besides resting, buying more supportive shoes from a source like “Run On!,” and cross-training in different activities can help. 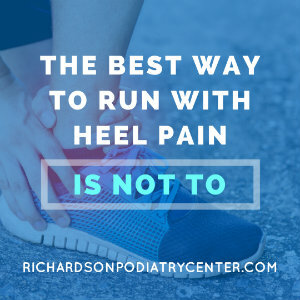 Other conservative treatments for heel pain caused by running and other physical activities include: stretching and strengthening exercises for your feet and calves, massages, taping, night splints, and custom orthotics. If you have the classic symptoms of plantar fasciitis and are not able to find the relief you need, give Richardson Podiatry Center a call at (972) 690-5374. We’ll help you find solutions to your heel pain so you can get back to your running program!